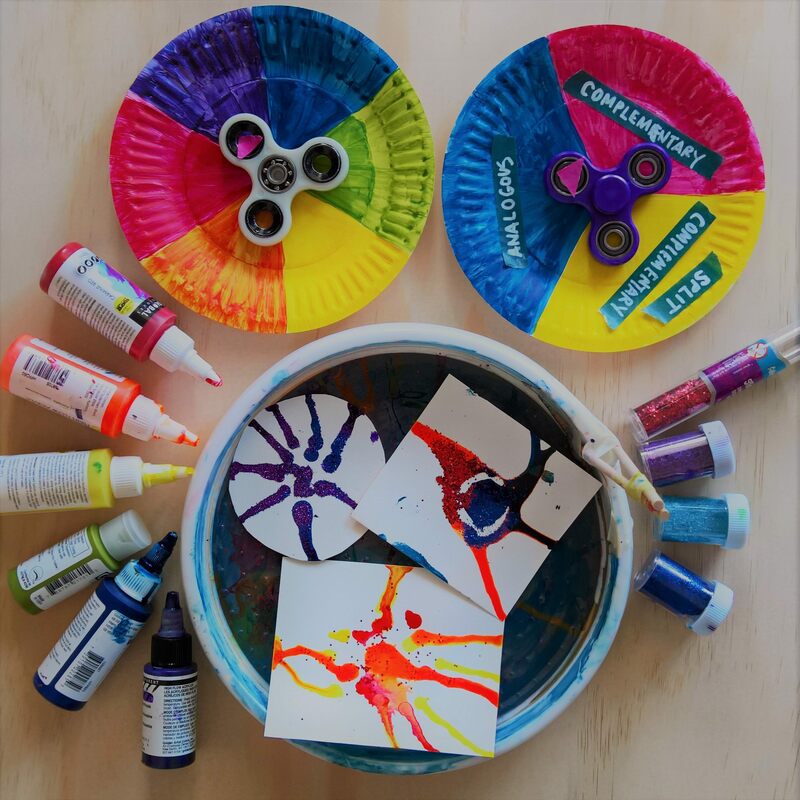 Have you tried doing spin art painting yet? In this STEAM lesson, we incorporate colour wheels and colour theory. And, we also include fidget spinners and glitter for extra fun and sparkle! • Cardstock or watercolour paper (cut in the right size, either square, rectangle, or circle). Step 1: Create paper plate colour wheels. Primary Colour Wheel – Just divide the paper plate into three and colour each section with red, yellow, and blue. Primary + Secondary Colour Wheel – Divide the paper plate into six and colour each corresponding section with red, yellow, blue, orange, green, and violet. Primary + Secondary + Tertiary Colour Wheel – This is best for older or more advanced students. You need to divide the paper plate into 12 and colour each corresponding section section with red, yellow, blue, orange, green, violet, red orange, yellow orange, yellow green, blue green, blue violet, and red violet. You can either get the students to paint these paper plate colour wheels or you can paint and prepare them beforehand. You also have the option of adding colour using pre-mixed paints, pencils, inks, or markers or doing a colour mixing exercise. If you’re getting the students to create these colour wheels in class, you can also talk about fractions and/or measurement of circles. If you wish to focus on the spin art activity and colour theory part of this lesson, just prepare these colour wheels beforehand. Step 2: Add a fidget spinner with an arrow. You can add a triangle shape on one of the tips of the fidget spinner using either a piece of paper or felt (just stick the shape on the fidget spinner with tape), or you can use a removable sticker, masking tape, or washi tape. I opted to use a piece of washi tape. If you don’t have a fidget spinner or you don’t wish to use one, you can assign a number to each colour instead and use dice to choose your colours. Alternatively, you can cut an arrow shape out of cardstock, punch a hole in the middle of the paper plate and the edge of the arrow, and attach the paper arrow on to the paper plate using a brad attachment. Step 3: Create a paper plate colour schemer. For beginners, I tend to focus on teaching three of these colour schemes: complementary, analogous, and split complementary. Add another fidget spinner with an arrow in the middle of this paper plate colour schemer. You can prepare this ahead of class. Step 4: Introduce the Spin Art activity. First, spin the fidget spinner or arrow on the colour wheel to choose a base colour. Then, spin the fidget spinner or arrow on the colour schemer to choose a colour scheme. Once you have the right colours, choose the corresponding paint colours. Put a few drops in the middle of the paper or cardstock. Make sure your paper is positioned in the middle of your spin art machine and the paint is watery enough. If the paint is not watery enough, just add a couple of drops of water. Spin the machine a few times to get your desired design. If you’re using a turntable or lazy susan, your machine might not go as fast as you’d like. Just try to spin as fast as you can. While the paint is still wet, sprinkle a bit of glitter that matches your colour scheme. Step 5: Talk about the Spin Art activity. What do you notice about the paint? Is it moving or staying still? What does the paint do when you spin the machine? Which direction is the paint going? Does it go towards the middle of the paper or does it go towards the edges of the paper? Why do you think the paint is doing what it’s doing? Depending on the level of the students you’re teaching, you can talk about centrifugal force. Step 6: Display or use the spin art paintings! Display them together on the wall or board. A group of spin art paintings look amazing. Use them as greeting cards or notecards. Use them to decorate notebooks or other supplies. Use them as collage papers. Science – Talk about motion, centrifugal force. Art – Colour theory. Action art. Mathematics – Fractions. Circle Measurement.